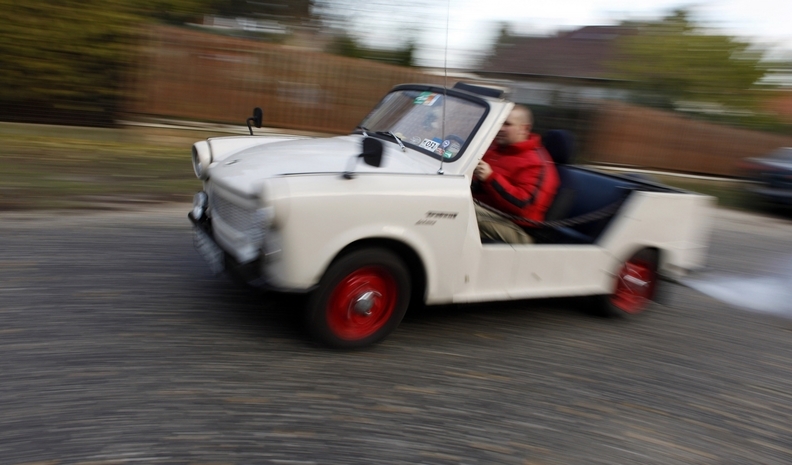 Trabant fan Peter Lorincz drives a vintage 601 cabriolet in Erd, near Budapest. BUDAPEST -- (REUTERS) Their spluttering engines, bone-rattling suspensions and outdated designs once ruled the streets behind the Iron Curtain. Now Soviet-made Ladas, Czech Skodas, Romanian Dacias, Polish Fiats, or the most famous of them all, East German Trabants, have become rare cars for collectors. The communist-built cars are few and far between in the former Eastern bloc countries in Europe. "Production stopped almost immediately once the Wall fell," said Gabor Muczan, president of the Trabant Club in Hungary. "That means the newest of these cars are 20 years old, a venerable age even for a good quality Western model." Muczan said collectors snap up the few usable vehicles for astonishing amounts of money. The last new Trabants sold in 1991 for 100,000 forints. Muczan said even his club's members own few communist-era cars, whose annual maintenance can cost more than the purchase price. Nostalgia has many car professionals and enthusiasts talk fondly of the cars, even though most produced little more than 70 horsepower, broke down frequently and afforded few luxuries. "They were not bad, those cars," said Jeno Boros, editor of a recently published book on old eastern European cars. "They were adapted to local conditions." With a few exceptions, the vehicles were licensed versions of Western brands such as Fiats, Fords, and Renault models. "The best, the worst and the best-selling cars were all Fiats," Boros said. "The Zastava, made in Yugoslavia, was a modified Fiat 128, probably the best all-around model." "The Polish Fiat 125, though, was so bad it was legendary. You tried to change the wheel, put it on a jack and the frame caved in." In 1970, the Soviets licensed the front engine, rear-wheel-drive Fiat 124 to build the Lada, probably the most ubiquitous car in the eastern bloc. They would produce it for decades. "The Lada was sturdy enough for Russian roads and weather," Boros said. As innovation was limited and competition nonexistent, cars could often stay in production, with barely any modification, for as long as 20 years. That is why Boros titled his book "Outdated Models." Good or bad, the cars sold quickly because there were so few of them. In the planned economy of the East, each country was assigned to produce a predetermined amount of goods, leaving most markets with far fewer cars than drivers. "Hungary's market could have soaked up any number of cars," said Agoston Kormendy, head engineer at the state import agency until 1989. "But because of currency restrictions, we could not import more than 100,000 cars per year, roughly." Hungary did not produce cars because it was assigned the bus and truck portfolio in the bloc. In exchange for every large vehicle exported, it could claim a certain number of cars. One Hungarian Ikarus bus was worth about 23 Ladas, Kormendy said. That market produced some peculiar economics. Would-be buyers had to sign up for a car years in advance. "I signed up for a Lada once," Kormendy recalled. "No privileges. They told me I'd get one in five years. I got it eight years later, at almost double the price." Shortage helped create the most famous of Communist-era cars, the Trabant. It was first produced in 1957 and the cheap design and basic technology helped resuscitate the car industry in postwar East Germany, Kormendy said. The two-stroke, two-cylinder engine was a concept from the 1930s, he said, adding, "it was so simple that any housewife could fix it on the kitchen table." 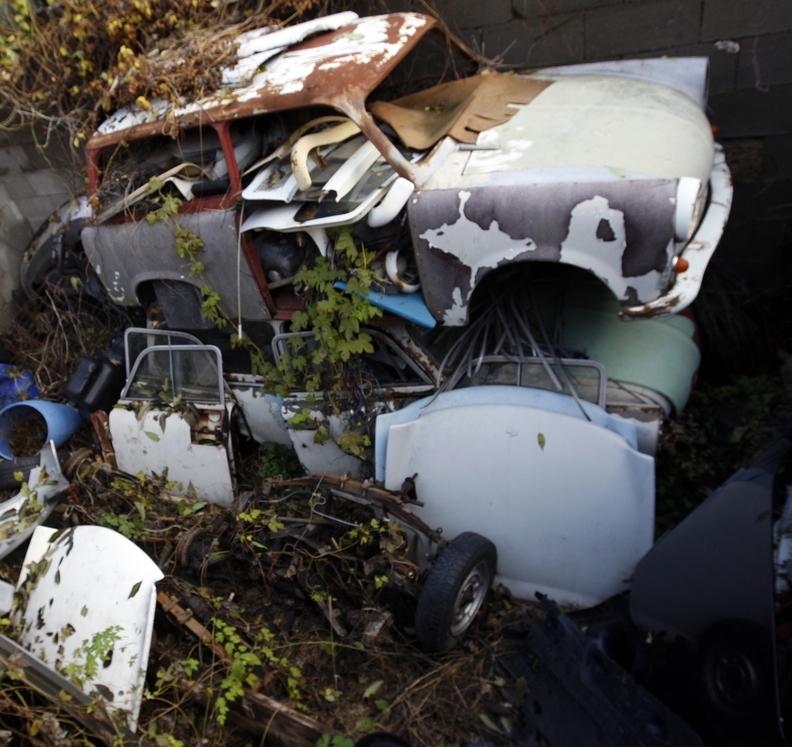 Peter Lorincz stores Trabant parts in his backyard. Maintaining communist-era cars can cost more than the purchase price. One of Trabant's biggest fans today was barely 12 years old when communism fell. Peter Lorincz, now 32, fell in love with his mother's new Trabant in 1988, and went on to collect them. His house, just outside Budapest, has a backyard full of scrap parts and a garage crammed with seven Trabants: four sedans, two station wagons, and a convertible. He brought the convertible out for a demonstration. It started without a hitch, and as Lorincz left the yard, a sticker on its tail heralded the Trabant's one-time mass appeal. "People's cars of the world!" it said. "Unite!"